Open the SfB Topology Builder. Navigate to Skype for Business Server /Shared Components /PSTN Gateway node. Right click and select New IP/PSTN Gateway . In the Define New IP/PSTN Gateway dialog box, enter the IP address or FQDN of the Mediatrix gateway unit. Define IPv4 as the IP protocol to be used. In the Listening port for IP/PSTN gateway field, enter the SIP port number the Mediatrix device is listening for SIP signaling. By default the Mediatrix device listens on port 5060 for TCP signaling, and 5062 for TLS signaling. Set SIP Transport Protocol to either TCP or TLS. With TLS, you must populate both the Mediatrix gateway and SfB server with the appropriate certificates, refer to Creating a Media5 Device Host Certificate with OpenSSL published on our documentation portal. In the Associated Mediation Server field, select the corresponding Mediation Server pool. In the Associated Mediation Server Port , set the Mediation server listening port for SIP. The PSTN gateway setup is now completed. Next step is to publish the topology and set up the necessary Route. Please consult your Skype for Business menu for further information. Perform the following tasks, in the specified order. For details on how to configure each step, click on the link. From the Type selection list, select the Connection type of your Uplink interface that best matches your network setup. From the Link list located next to Lan1 , leave the default value. In the Static IP Address field, enter the LAN static IP address as defined in your network address range. A Warning message is displayed, but this is normal. The Lan1 Network Interface will be available in all the lists of the Management Interface where a Network Interface needs to be selected. For example, in the Local Firewall, and Configuration pages. In the Host Name Configuration table, from the Configuration Source selection list, select Static . In the Domain Name field, enter the domain name of your unit. In the Host Name field, enter he host name of your unit. Time Servers should be configured under Network/Host/SNTP Configuration. For more details refer to the VLan Configuration guide published on the Media5 documentation portal. In the Time Configuration table, in the Static Time Zone field, specify the time zone in which the Mediatrix unit is located. If preceded by a minus sign (-), the time zone is east of the prime meridian, otherwise it is west, which can be indicated by the preceding plus sign (+). For example, New York time is GMT 5. Any DGW parameter referring to a time value will use the local time described by this time zone reference. The Hoc.SystemTime will return the unit local time in accordance with the configured time zone. Go to SBC /Configuration . In the Signaling Interface Configuration table, from the Network selection list located next to uplink_s , make sure Uplink is selected. The Network Interfaces displayed in the Network column, are created under the Network /Interfaces page. In the Port field, set the SIP listening port for the Sbc service, if a listening port other than 5060 is required, or leave it as it is. Click restart required services , located at the top of the page. The Signaling Interface will be available when configuring a Call Agent, in the Configure Call Agent page in the Signaling Interface selection list. The lan1_s signaling interface is preconfigured by default. This step will only be necessary if the lan1_s signaling interface was deleted or modified. In the Signaling Interface Configuration table, from the Network selection list located next to lan1_s , make sure Lan1 is selected. In the Media Interface Configuration table, from the Network selection list located next to uplink_m , make sure Uplink is selected. The Network Interfaces displayed in the Network column, are created under Network /Interfaces page. In the Port Range field, set the media (RTP) port range, if a port range other than 20000-20999 is required, or leave it as it is. The Media Interface will be available when configuring a call agent, in the Configure Call Agent page, in the Media Interface selection list. The lan1_m media interface is preconfigured by default. This step will only be necessary if the lan1_m media interface was deleted or modified. In the Media Interface Configuration table, from the Network selection list next to lan1_m , make sure Lan1 is selected. The Media Interface will be available when configuring a call agent, in the Configure Call Agent page in the Media Interface selection list. Rulesets must be imported. The latest Ruleset package can be found on the Media5 Support Portal (you will be required to supply a user name and password). This procedure is valid for Call Agent and Routing Rulesets. Go to Management /File . Required Rulesets depend on the scenario being configured. Refer to the Call Agent and Routing Ruleset sections of the configuration notes for details on Rulesets needed to complete the configuration. Step 2 is only required when importing the first Ruleset and if you are not using a secure connection to access the Management Interface (http://). Click Activate unsecure file transfer through web browser . From the Path field, select sbc/rulesets/. Click Browse , and navigate to the Ruleset you wish to import. Ruleset file extension must be *.crs for Call Agent Rulesets or *.rrs for Routing Rulesets. The imported Rulesets will appear in the Internal files table, with the selected path in front of the name. The Ruleset will be available in the tables of the SBC /Rulesets page. 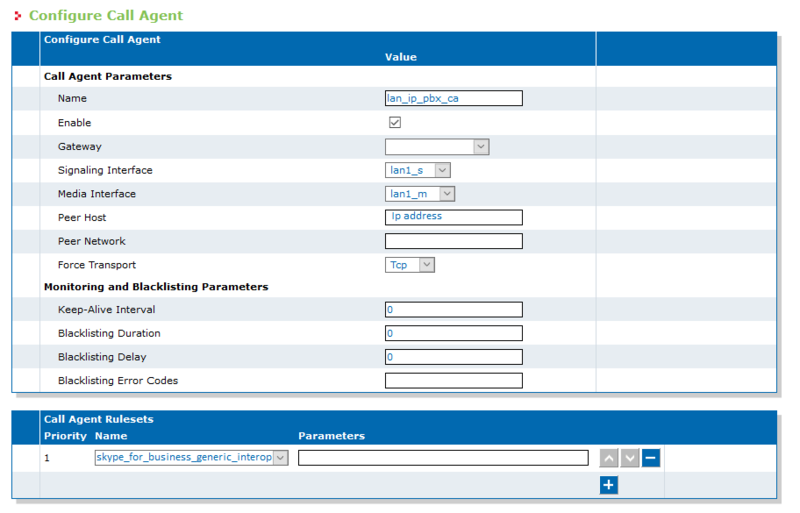 In the Call Agent Configuration table, click located on the same row as lan_ip_pbx_ca . From the Signaling Interface selection list, select lan1_s . From the Media Interface selection list, select lan1_m . Set the Peer Host to the IP address of the IP PBX. Set Force Transport to TCP or TLS . In the Call Agent Rulesets table, from the Name selection list choose skype_for_business_generic_interop.crs. In the Configuration page, click Save . No will be displayed in the Config. Modified field, indicating that the configuration that was modified is now applied to the system. When the Mediatrix SBC unit will use the selected Call Agent for a communication, the selected parameters will be applied. Select the Enable check box, located next to wan_ip_trunk_ca . In the Call Agent Configuration table, click next to wan_ip_trunk_ca . From the Signaling Interface selection list, select uplink_s . From the Media Interface selection list, select uplink_m . Set the Peer Host to the IP address of the service provider server or FQDN. Set Force Transport to UDP or TCP or TLS depending on your SIP trunk provider . In the Call Agent Rulesets table, from the Name selection list select generic_sip_trunk_interop.crs. 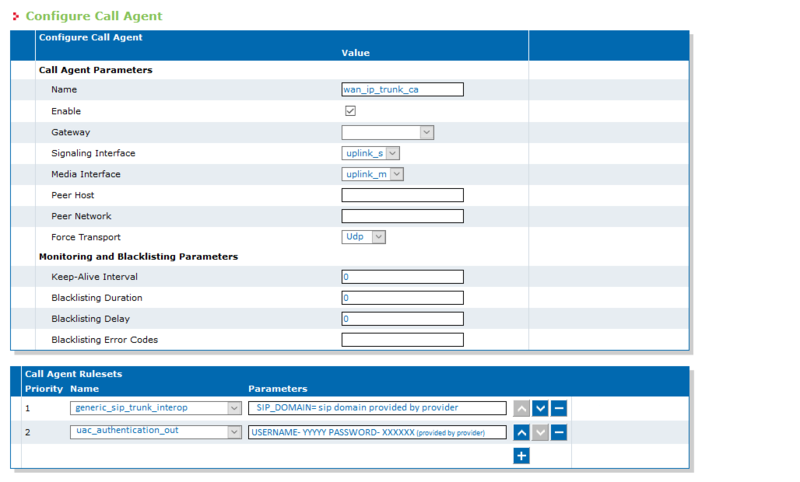 In the Parameters field, enter USERNAME=YYYY Password=XXXX. Replace the YYYY by the username and XXXX by the password provided by the provider. In the Call Agent Rulesets table, from the Name selection list select uac_authentication_out. In the Parameters field, enter SIP_DOMAIN=WWWW. Replace the WWWW by the SIP domain provided by the provider. No will be displayed in the Config. Modified field, indicating that the configuration that was modified is now applied to the system. When the Mediatrix SBC will use the selected Call Agent for a communication, the selected parameters will be applied. The sfb_wan_ip_trunk_route.rrs routing ruleset must first be imported to DGW. Refer to task_a5v_y2q_bq . In the Routing Rulesets table, from the Name selection list, select tsfb_wan_ip_trunk_route.rrs . In the Parameters field, enter USERNAME= YYYYY Password=XXXXX. Replace the YYYY by the username and XXXXX by the password provided by the provider.